Seahawks Mailbag: Could Seattle trade Thomas for Mack? Could Shaquem Griffin earn a larger role? 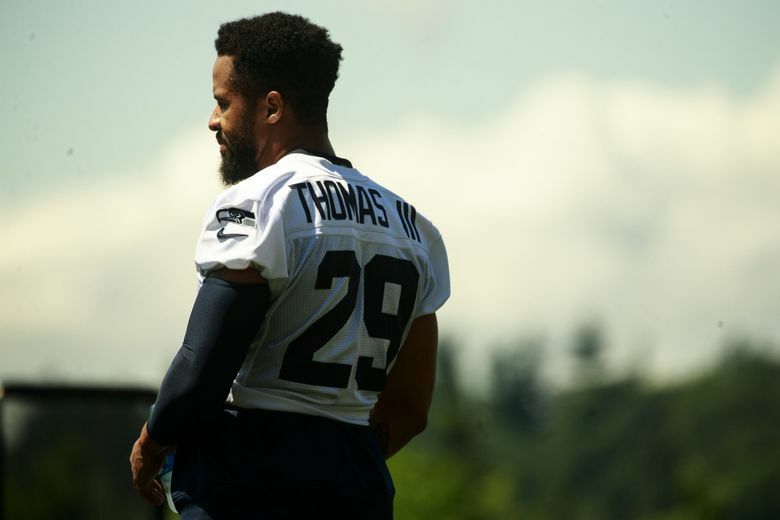 There's little new to report on the Earl Thomas situation. But could there be a way out with another disgruntled star? That and more as Seahawks beat writer Bob Condotta opens up his inbox to answer your questions. A break in the action for the Seahawks Tuesday meant a chance to answer a few questions via Twitter. So here we go. What do you think is reasonable compensation for a trade with Oak to get Mack? (With the assumption ET is the focal point of the trade) Essentially, what would you give up, Bob? A: Here’s the thing — it really doesn’t matter what I think, or anyone else other than the Raiders (Mark Davis and Jon Gruden, specifically). The thought is they’d probably want a significant haul in draft picks, likely as much as two first-rounders, for All-Pro defensive end Khalil Mack. I see no way the Seahawks would come anywhere close to that. I think Seattle right now may be valuing its future draft picks more than ever after having given up quite a few the past year or so in the Duane Brown and Sheldon Richardson trades and with the team in “retooling” mode. There are also the financial implications of knowing that to make it worth it you’d have to try to pay Mack a really big salary going forward, probably rivaling or topping what Aaron Donald is going to get from the Rams any day now. But despite how contentious things appear to have gotten between the Raiders and Mack, the conventional wisdom is still that he stays put for now. One person I know who covers the Raiders said the thought is the team still expects him to return and then play on his fifth-year option this season at just over $13 million. Conversely, one of the problems with trying to deal Thomas right now is that he only has one year left on his contract and obviously wants a long-term extension and also probably wants to be the highest-paid safety in the NFL. That’s undoubtedly why the Seahawks haven’t been thought to get the kind of offers for Thomas one might expect when considering simply what he has meant to the Seahawks since 2010. While I’d never rule out anything — and Seahawks GM John Schneider and Oakland GM Reggie McKenzie are close friends — just not sure I see a logical trade working out here. What do they plan on doing regarding the Earl Thomas situation ? A: At the moment, nothing. I think the plan is to just wait for Thomas to eventually show up with the knowledge that he has to at some point to prevent his contract from tolling. The general thought is he has to return by week 10 for that to happen but he might return a couple of weeks earlier to assure that it doesn’t as Seattle could have the option to put him on an exempt list for two weeks when he returns. I don’t think the Seahawks plan to offer Thomas anything or negotiate in any way at this point. I think the plan is to just sit and wait it out. What’s the deal with DRC? A: This is a reference to a visit last week by veteran cornerback Dominique Rodgers-Cromartie, a 10-year vet and two-time Pro Bowl pick — most recently in 2015 — who remains a free agent. ESPN’s Josina Anderson reported that the visit went well and the Seahawks were impressed with Rodgers-Cromartie. It’s worth remembering teams bring in players all the time for visits and while some result in immediate signings, a lot of times they are also just to get information and create a relationship for down the road. Rodgers-Cromartie is also said to have garnered interest by Washington and it’s possible he wants to wait a little while and see what else might be out there. Seattle’s M.O. this year has been said to be to make one offer to a player and that’s that. It’s thought that’s part of why J.R. Sweezy signed a month after visiting — he had an offer the whole time but waited to see what else might materialize. Seattle’s interest in Rodgers-Cromartie speaks to a cornerback spot that remains a little unsettled. Shaq Griffin is set at left corner and Justin Coleman at the nickel. But injuries have played a big role in leaving the right cornerback spot something of a merry-go-round in the last week or so. Byron Maxwell ran as the starter at that spot for the first week-and-half or so of camp before being sidelined with a groin issue. Two others who have seen first-team time there — Neiko Thorpe (wrist) and Trovon Reed — have also been out the last week or so with injuries. None of the three played against the Colts, with rookie Tre Flowers starting at that spot. The other two players who have seen time there in recent days are recent free agent signee Jeremy Boykins and veteran Dontae Johnson, who started 16 games for the 49ers last season but has had a slow start to his Seattle career after suffering a broken foot in the offseason program that required surgery. That either looks like a lot of potential depth or a lot of potential question marks. Rodgers-Cromartie has ample experience at both left and right corner and in the slot, so if he were to be brought in you’d figure he could compete at RCB and serve as depth at the nickel. But Seattle likely isn’t offering a whole lot and Rodgers-Cromartie may be playing things out to see what else may be out there. How quickly the likes of Maxwell, Thorpe and Reed return — and how quickly Johnson gets up to speed after doing a bit more in practice this week — may determine if things get more serious between the Seahawks and Rodgers-Cromartie. Why do you never, ever respond to any of my tweets? Oh and a real question, Is Shaquem a unique enough talent that they might design sub-packages to leverage his ability? A: 1, Here you go. 2, I think that’s still to be determined. Griffin’s first game was promising, to be sure. But it’s also worth remembering that the preseason is the preseason — there’s a really long list of guys who did a lot in first preseason games who nobody remembers. That’s not to try to be negative in any way just to be realistic. It was interesting hearing the assessment of defensive coordinator Ken Norton this week when he was asked that very question — could it get to a point where the team had to find ways to get Griffin on the field even if he doesn’t beat out K.J. Wright? I think the comments of both Norton and Carroll this week about Griffin may have been designed in part to try to tamp down the expectations just a little bit since they know there is more-than-the-usual fanfare associated with all things Griffin at the moment. Also, the Seahawks have never really done a whole lot of carving out specialty roles on defense other than for obvious sub packages such as nickel or spots where there are regular rotations (tackle, end). Not to say they couldn’t do it, but I think for now they’ll take it one step at a time and let Griffin get comfortable at his main job at weakside linebacker and on special teams. And if you were wondering if the Seahawks might be tempted to move Griffin to another spot — say, safety — Norton also made clear that they like where he is.